Fine artist and book illustrator Kristen Margiotta pursues a unique style and her own original characters, which makes her work immediately distinctive and personal. Working largely in black and white oil paints with dark accent colors such as red, Margiotta created the recurring character of Cherry based on herself and evocative of the cartoonist’s aesthetic, with large eyes and simplified features, as an art student in 2005. This December Margiotta will be showing her work at New York City’s AFA Gallery (formerly known as Animazing Gallery) in Soho. This premier gallery for cartoonists, fine art illustration, American illustration and animation has featured the work of Maurice Sendak (Where the Wild Things Are), Dr. Seuess, Tim Burton and Peanuts illustrator Charles M. Schultz. In addition to her original paintings, Margiotta produces designer merchandise, such as buttons, purses and postcards. 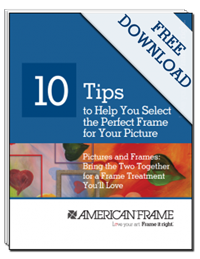 Many customers also take her work home in the form of digital and archival prints, such as those customers can order through American Frame. The featured piece, “Cherry and the Conjoined Twins” is classic Margiotta—character, color and mood synthesized into her unique style. The original was done when Margiotta was invited to show at Gallery 309 in Philadelphia, her first gallery exhibit in the city. She conceived the piece as homage to another Philadelphia treasure, The Mütter Museum, a collection of scientific and medical history exhibits run by The College of Physicians of Philadelphia. One of its most famous exhibits is that of conjoined twins, on which Margiotta’s painting is modeled. Another well-known exhibit in Mütter features cross-section slides of Albert Einstein’s brain. We’ve framed “Cherry and the Conjoined Twins” in a simple frame that still manages to be bold thanks to the mats, a necessity when framing something as strongly colored and proportioned as Margiotta’s work. The frame is from our EcoCare collection, an environmentally friendly collection of solid-wood frames made from sustainably harvested wood and finished with water-based products and gesso to ensure it is 100% recyclable. 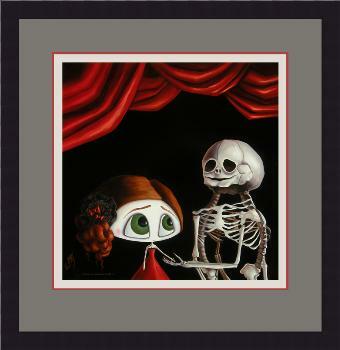 The bottom mat is a grayish-white that works well with the color of the conjoined skeleton. The middle mat plays off the red curtains, a shock of color that keeps the image and its treatment from becoming too dark. The top mat is a deep gray, introducing the unexpected “third color” that lends vibrancy. Note: This is an oversized piece (over 54 united inches). An oversize handling fee will be in your total at checkout. Free ground shipping applies.